The beautiful wooden structure of the Lynnwood Hotel once sat on the west bank of the Doe River on the east end of Elk Avenue. It was built in 1907 and for a short time was called the Governor Taylor Hotel. The hotel boasted of 35 rooms, a beautiful ballroom and even had a bowling alley. It was later named the Lynnwood Hotel which would remain its name for the rest of its existence. 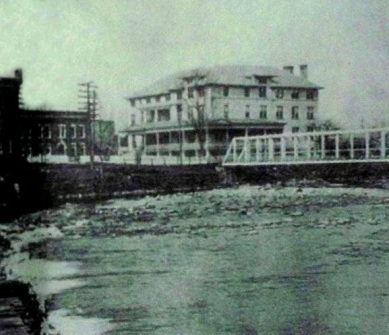 Early advertisements listed the Lynnwood Hotel as the Heart of the Alleghenies and summoned vacationers to a "Summer Day in the Mountains". As was promised, the hotel provided hot and cold running water, telephone and electric lights in every room and steam heat. The steps of the hotel became the ideal gathering location for prominent speeches and political debates. 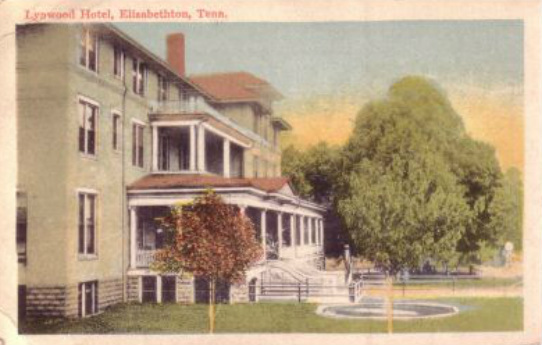 For many years the hotel was considered the hot spot of Elizabethton. The hotel along with the Monument became a primary gathering spot for current information as well as war time news. Many prominent historical figures spent time in Elizabethton and visited the Lynnwood Hotel. According to Lynnwood Hotel records, the hotel hosted Warren G Harding who was an influential self made newspaper publisher from Ohio. Mr. Harding would later become the 29th President of the United States. A stay was also recorded by William Jennings Bryan. Mr. Bryan was a leading American politician which would unsuccessfully run for the United States Presidency three times. Although Mr. Bryan would never win the Presidency, he would be appointed as the 41st United States Secretary of State by President Woodrow Wilson. xThe most famous individuals that would visit the area and stay at the Lynnwood Hotel may surprise you. The visit occurred in the summer of 1918. This group of male visitors called themselves "vagabonds" and came through this area to visit Dr. Derthick of Milligan College while enroute to the Smokey Mountains to enjoy a camping trip. The gentleman that had connections to Dr. Derthick was none other than Henry Ford the founder of the Ford Motor Company and creator of mass production of vehicles. Mr. Ford became one of the richest and best known people in the world. The photo below shows the "Vagabonds" as they began their travel to this area. Accompanying Mr. Ford was a group of wealthy and influential people. Among them were Harvey Firestone Sr. and Harvey Firestone Jr. The Firestone family founded the Firestone Tire and Rubber Company and was one of the first global producers of automobile tires. The last member of the group was none other than Thomas Edison. As most everyone is well aware, Mr. Edison was arguably the most famous inventor of all time and was credited with 1093 patents for inventions during his life. His most well known inventions include the light bulb, the phonograph and the movie camera. The most high profile visit to the Lynnwood Hotel was a visit by Presidential candidate Herbert Hoover and his wife as they spent the day in Elizabethton on October 6, 1928. Mr. Hoover and his contingent stopped by the Lynnwood Hotel for a tour and dinner. Hundreds of supporters gathered outside the hotel to get a glimpse of Mr. Hoover. The hotel was decorated with all types of red, white, and blue flags along with many other patriotic window dressings. As the Hoover family along with several other local officials sat down to a meal, the crowd waited patiently on the porch, front yard and street as seen in the photo above. Through the continuing years, the Lynnwood Hotel hosted visits from every Tennessee Governor from 1907 until shortly before it closed. The Lynnwood Hotel would continue its success until the early 1970's. Within the Lynnwood complex in its final days were apartments, a well known cafeteria and a dance studio. Sadly, in May of 1972, the property was sold by owners Teddy and Polly Sisco to the Urban Renewal Project for $178.000. A public auction was held to sell the contents including beds, wall hangings and all furniture The structure was demolished later that year to improve parking on the east end of town. The hotel and adjoining restaurant were open for almost 70 years and is still revered by many as one of the memorable structures of its time. During the research phase for another subject, the CCH staff while working with Joseph Penza and the Archives Department of the Elizabethton Public Library found a brief video clip that was taken the week of October 6th, 1928. The CCH staff has extracted and enhanced the footage. You will get a glimpse into Elizabethton life in 1928. You can see the Lynnwood Hotel as they were preparing for the Herbert Hoover visit. Notice the decorations and a man cleaning the outside windows on the 2nd floor. You can also see a small tent that has been raised and appears to be some type of sign-up area or ticket office for the upcoming event. Enjoy your glimpse into 1928.